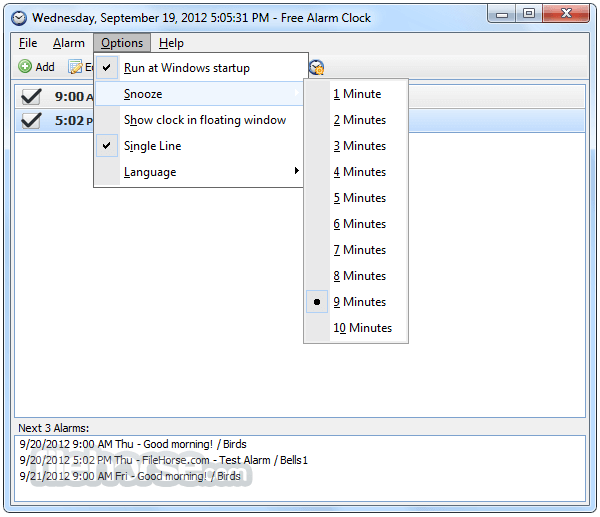 Time - Alarm time in your Windows native format. Repeat - You can set one-time alarms or repeating alarms. You can use the same time and sound settings on consecutive days after you set the initial alarm. Label - Label different alarms to indicate activities you must do at the sound of the alarm. Show message - If this checkbox is unchecked, then the signal can be stopped by clicking the icon in the system tray. Sound - Select the sound you want to wake up to. You can adjust alarm sound by pressing "Browse" button. The alarm clock comes with several sounds and offers full access to your music library. Turn on the volume - When the time comes to activate your alarm, the program will set alarm volume to a predefined level. Loop - The sound plays repeatedly. 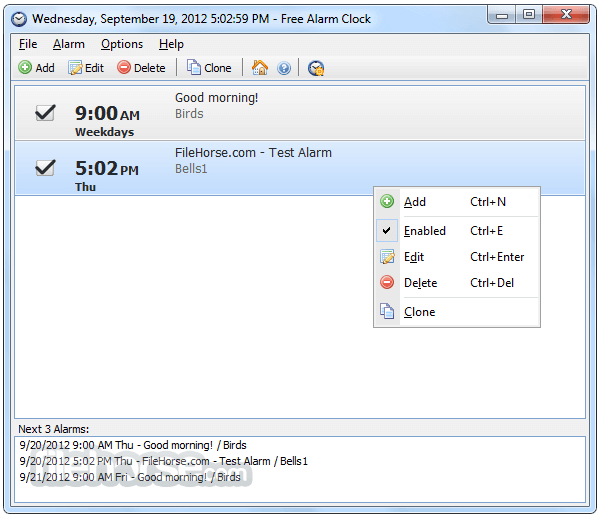 Snooze - Activates the "Snooze" feature on your computer. Wake up computer from a sleep mode - While your PC is in sleep/hibernation mode and the time comes to activate your alarm, Free Alarm Clock will wake up your computer. Turn on the monitor power - Allows you to turn your computer's monitor on.